A friend gave me this book and said "You've got to read this; it's the best book I've ever read." A big build up. It sat for about 6 months on my to-read shelf by my bed and every time I ran into my friend, Rocky, he would say..."Have you read it yet?" and I'd have to say "not yet, but I'm going to get to it soon." I put a limit on it for myself; I needed to finish it by July. I finished it last night at 11:57, (July 31). It only took me four days (in between single mother duties as the male half of my family is off on a mission trip to W.Va.) and I liked the book. I don't think it is the best book I've ever ready but I liked it. Mostly it points out human frailty and that it has been with us since the beginning of time. The book is a bit of historical fiction, according to the author, but not completely. He's mixed true factual events and real people with a whole lot of fiction. 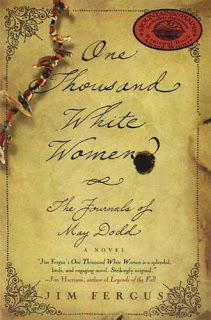 The book begins with a peace meeting between Little Wolf, the Sweet Medicine chief, addressing the President of the United States, Ulysses S. Grant, Little Wolf's request was that if 1,000 white women joined them, became brides of Native men and had babies this would be a clear path to assimilation between the races. The idea made perfect sense to the Cheyenne but the peace meeting collapsed and all went home. This book interjects to change the outcome...What if 1,000 white women did marry into the Cheyenne tribe? What then? May Dodd is a fictitious character who reads like a real person so well is she created. She's a woman of means from Chicago who had the misfortune of falling in love with, Harry, a foreman with her father's company. They live scandalously, unmarried, and have two beautiful babies together. One night while Harry is off drinking, men come and take May and the babies away. The babies end up with May's parents and she ends up in a lunatic asylum-her illness is reported as "moral perversity." She is approached one day by special permission as she's not allowed to be near men at all during her "confinement" due to her "condition." She and several other women are given the opportunity to volunteer for the Brides for Indians Program. May signs on immediately as this, in an odd way, is her ticket to freedom. As these women travel west on the train we get to know them and it is these women and the friendships that make this book worth reading. My favorite character was Phemie, a strong African escaped slave who made her way to Canada and then signed up for the program to become truly a free woman. I understood her motivation and her need to connect with the Cheyenne. There are many interesting themes in this book but the idea of humanity came to me over and over. I wanted May to grandly discover how beautiful Native culture was-and she does to some extent-but every time she feels that way something negative happens and she is thrown backwards. Toward the end of the book my mind kept thinking about our current situation in Iraq and Afghanistan, in a no-win situation bullying another culture, just as we did with the Native Americans. Life keeps circling and humans do terrible things to each other in the name of religion and assimilation. The book made me think, question some preconceived notions and, especially, appreciate the strong women this book introduced me to. The image of Phemie on horseback, May writing, Helen painting and the Kelly twins will stay with me for a long time. This would make a wonderful book club choice as there are so many elements to discuss.